Architect of Record: HKS Architects, Inc. Floor Area: 750,000 sq. ft. 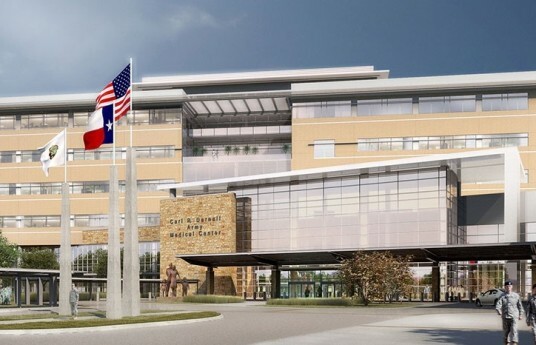 Comments: Projected by the Army Corps of Engineers to open for patient care in the summer of 2015, this 2,023,000-square-foot facility will replace the existing Carl R. Darnall Army Medical Center at Fort Hood in Texas. This project consists of a six story cast in place concrete hospital tower along with three cast in place concrete clinics. Each of the clinics and the hospital have structural steel interstitial floors hanging from the concrete floors above. The interstitial space is used for mechanical, electrical, and plumbing. The 25,000 sq. ft. Central Utility Plant was constructed with a structural steel frame. The finished project will include a 612,000 sq. ft. hospital building with 128 beds (including bassinets), three clinic buildings and three parking structures.